I was honoured to be the guest speaker at last years Auckland Lacrosse League Annual Dinner and Prize Giving, which doubled as a send off and fundraiser for the World Championship bound New Zealand Women's U19 team. The theme of my speech was that Champions are made, not born and that no-one is inherently great - it is what we do that defines our greatness and our ability to achieve success. I outlined some of the key differences in mind-set between athletes in various countries that I have worked with, and the differences in mind-set between minority and majority sport athletes in those countries. The key things that I have noticed is that there are two simple things that seperate many athletes who achieve, from those that do not. Belief is that subtle, underlying pattern of success. It is the unconscious, survival based mechanism that let's us know that to achieve greatness is both safe and appropriate. Champions ave already imagined themselves as such. They have 'seen' in their minds eye their future success and podium finishes, and have framed the way they talk to themselves (often without even realising it) in a way that influences the subconscious mind to not only not reject success, but to seek it out, and to recognise those factors in our environment that will make it a reality. On the other hand if we tell ourselves that we aren't good enough, that we can't succeed and imagine the failures we could make, then these will become our future reality. In minority sports (such as Lacrosse in New Zealand) it is easy to give up before the whistle has even started if playing one of the world powers of Lacrosse (like Canada for example). But the belief that 'we can't win' can quite easily go from something that is a conscious probability (let's face it, the Kiwis winning against Canada would be a huge feat) to something that is a subconscious belief, and therefore a virtual certainty. Hard Work is always necessary to achieve and maintain greatness. This lyric is such a great metaphor for the mind-body connection and for the value of hard work. The 'spark' in this analogy at least I equate to the belief. Without that belief - or 'spark' there is no chance to start a fire (succeed) but with belief, AND the air you breathe (work) fanning the flames it is all but assured in some sense at least. Whether or not we do succeed is dependent on many factors, but without belief and hard work it all some to naught. I finished by challenging this room of talented and committed young athletes to not be content to be mediocre. To strive for glory, to shoot for the stars...the worst that could happen is that they end up reaching the moon. I challenged them to not be 'luke-warm' but instead to rise to a level greater than that of their competition, so that they (their adversaries) are luke-warm in comparison to the love and passion that they bring to their game. We often load ourselves up when we travel, because we want to be prepared for various situations. This burden of being prepared leaves us with our arms full, unable to receive whatever is there when we arrive. It leaves us tired from carrying, so that we are not happy when we meet someone new on our travels. What if we travelled with empty hands, ready to embrace new experiences, receive new foods, touch new people? We might feel less prepared when we leave, but the preparedness is an illusion. Stuff doesn't make us prepared. Having empty hands but a heart that is full of love leaves us prepared for anything. This doesn't just apply to taking a trip, but to living each day. Each day is a journey, and we load ourselves up with material possessions, with tasks and projects, with things to read and write, with meetings and calls and texts. Our hands are full, not ready for anything new. Drop everything, be open to everything. 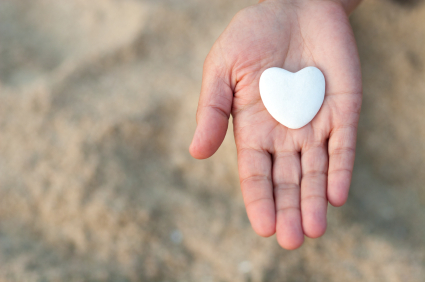 Enter each day empty-handed, and full-hearted. Happiness is a Doing, Not a Happening! 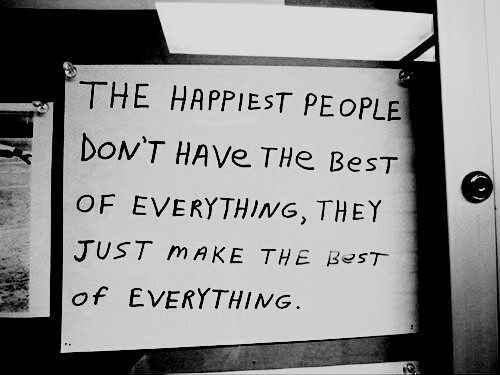 The happiest people I know have not had the easiest lives. In fact many of the most positive, encouraging, caring and compassionate people I know - the people that I consider my 'ambassadors of #PMA' (Positive Mental Attitude) have had to deal with terrible tragedies; grief, loss, trauma and abuse of many kinds. But in spite of those things they choose a life that's worth living, they choose to play their role in making the world a better place, and they choose to help prevent the things that have happened to them happen to others. In short they choose happiness. In practice I have had several patients say something along the lines of: "But Cliff - you just wouldn't understand...you're obviously just a naturally happy guy!" And in one respect they are right. Happiness IS my nature...but it's y nature by intention and practice, not by accident or coincidence. It's something I have chosen to become my reality at some of the darkest moments of my life. Those moments are not for the recounting now, and they may never be in entirety; for they are moments of the past that were difficult, heart breaking, traumatic and trying, but they are my moments nonetheless - moments that have made me more caring, considerate, considered and compassionate. 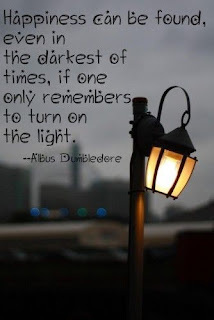 Seeing the light in the darkness is not always easy, but making the decision to flip the switch is. We can choose to live instead of merely being alive. We can choose happiness. When you see a smile on someone's face, don't assume that they have had life easier than you, for we know not what someone's been through. A smile isn't just something that happens to us, but is a beautiful challenge in the face of life's adversity that we can, that we will, that we ARE living a life of passion, love and purpose.